Burnett County, WI - Official Website - Did You Know? You are here: Home > Feature Links > Did You Know? Burnett County has over 500 lakes, 10 major rivers and 30 streams. World Series Champion pitcher Jarrod Washburn grew up in Burnett County and attended Webster Schools. He currently pitches for the Seattle Mariners. Manufacturing is one of the most important parts of Burnett County’s economy and this sector makes up the largest payroll of any economic sector. There is 150,000 acres of public land in Burnett County. The legendary Jordan Buck, was shot along the Yellow River Just South of Danbury. A private road is now named after the former world record buck as a tribute to the world famous deer. Currently, the second largest buck on record, it held the record for a couple of decades before losing the title in the late 1990’s. 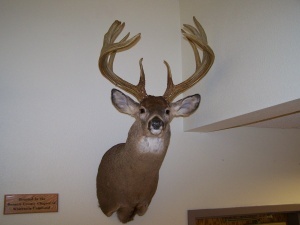 A replica Jordan Buck can be viewed at the Crex Visitors Center. See the hunting page of this website for the entire story. The St. Croix National Scenic Riverway is one of only two national parks in the State of Wisconsin. Molly Engstrom, raised in Siren, played hockey on the 2006 Olympic team and won a bronze medal. She also was a 2005 World champion, a 2005 Four Nations Cup silver medalist, and a 2004 World Championship silver medalist. Molly also played college hockey for the University of Wisconsin. She was named Western Collegiate Hockey Association's Defensive Player of the Year twice (2003, 2004) and was a top-10 finalist for the 2005 Patty Kazmaier Award. Talking to the Burnett County Sentinel about support from her home town she said, “It's nice to get phone calls from home and so nice to have support back home. I don't feel like I'm in it on my own. It's very much appreciated. I'll never forget where my roots are." The State record sturgeon (hook and line) was caught in Yellow Lake in 1979 and weighed 179 pounds and 10 ounces. During World War II, there was a LST-512 tank landing ship named the USS Burnett County. Named for Burnett County, Wisconsin, she was the only U.S. Naval vessel to bear the name. LST-512 was assigned to the European Theater and participated in the Invasion of Normandy in June, 1944. She returned to the United States and, on 28 March 1947 was decommissioned and assigned to the Pacific Reserve Fleet. On 1 July 1955 the ship was redesignated USS Burnett County (LST-512), and was struck from the Naval Vessel Register on 18 February 1957. LST-512 received one battle star for World War II Service. On 11 October 1957 she was sold to Peru and renamed BAP Paita (LT-35).Burnett County’s population grows to between 40,000 and 60,000 people on any given weekend in the summer. Eleven wildlife areas are located in Burnett County including the world famous Crex Meadows Wildlife Area. Two historic trading posts have been restored on their exact locations. The XY Company and the Northwest Company can be viewed at the Forts Folle Avoine Historical Park. Did you know the Grantsburg Rotary Club chartered in 1940. Forts Folle Avoine Historical Park is named after wild rice. When the French saw the wild rice they thought it was oats; Folle Avoine meaning crazy oats. Burnett County is home to an artist community who specialize in poetry, painting, and photography. Comedienne Mary Mack (Mikelle Budge) was raised in Webster, WI and graduated from Webster High School. She has performed on Comedy Central (‘08), NBC Last Comic Standing (‘08), National Lampoons’ Comedy Hour, HBO-The Comedy Festival (Andy Kaufman Awards) (’07), won the California Funny Female Contest ('05), and has performed at comedy clubs througout the country. Her endearing stage presence and off-kilter, musical surprises, stems from her background as former music teacher and polka bandleader. Mack received her undergraduate degree in music from the University of Wisconsin-Oshkosh, and got her MFA in conducting from Middle Tennessee State University.